The Drive folding scooter can be folded and unfolded by remote control in under 20 seconds, making this an excellent choice for users on the go. Price excluding VAT.(Incl. VAT £2,274) *VAT Relief available on this product. This lightweight folding scooter has been designed to be transported and stored away with ease, making The Drive ideal for travel. The Drive folding scooter can be folded and unfolded by remote control in under 20 seconds, making this an excellent choice for users on the go. You'll have added peace of mind with safety features, such as speed reduction when cornering, an auto stop function, and anti-slip footwell carpet. This scooter weighs in at only 20kg making it a brilliant choice for cruises, flights, and bus trips. 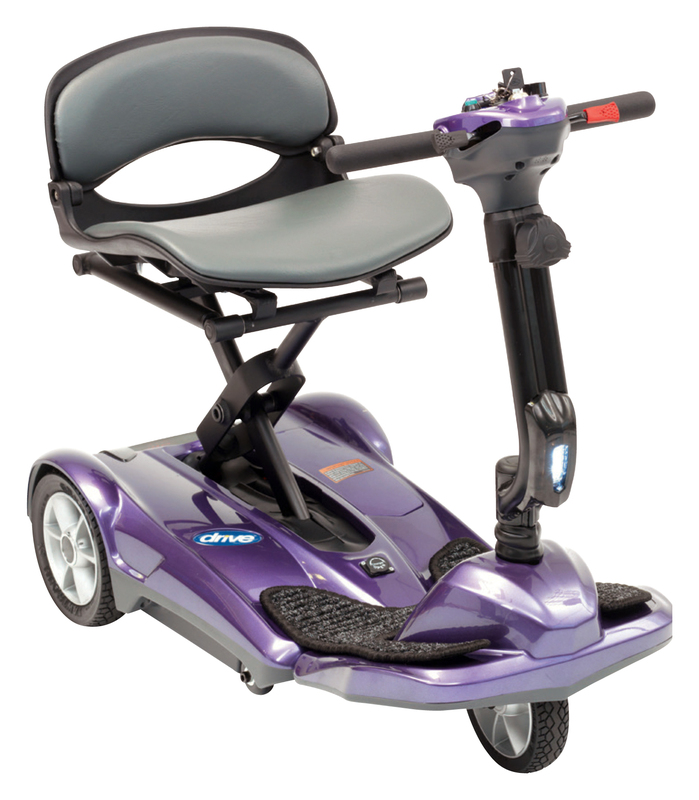 It has a top speed of 4mph and a maximum travel distance of up to 6 miles on a fully charged battery. Please fill in this form to have your questions answered, or to enquire about our products or one of our other lightweight mobility scooters and electric wheelchairs. You may also be eligible to enjoy a FREE home demonstration of a selection of the best folding electric wheelchairs and mobility scooters, all without obligation. Or simply call 01803-220-378 (Devon) or 02392-255-600 (Hampshire) for your first step to independent and portable freedom. Copyright © Cavendish Health Care Ltd. Registered as a limited company in England and Wales under Company Reg. No: 06534461. Registered address: 4 Sudley Road, Bognor Regis, West Sussex, PO21 1EU. Any trademarks belong to their respective owners. Availability and prices may be subject to change without notice.